Rumour No. 1: Newly appointed Inter Milan manager Rafa Benitez is to risk incurring the wrath of his former employers by launching a bid to pinch Standard Liege striker Milan Jovanovic from under Liverpool’s collective noses. Jovanovic agreed to move to Anfield ‘in principle’ during the January transfer window whilst Benitez was still at the helm, but the Spaniard has since moved on to the Guisseppe Meazza and it would appear that the Serbian international is poised to follow suit. Rumour No. 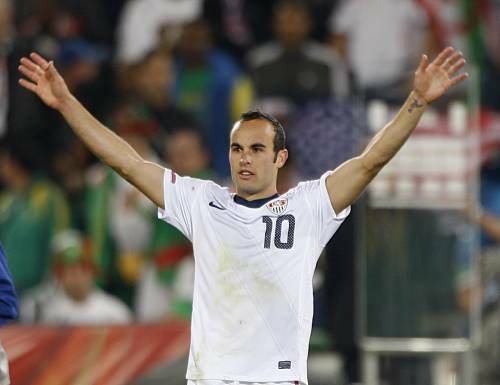 2: Manchester City are chasing L.A Galaxy golden boy Landon Donovan, after the American winger impressed during his loan spell at Everton during the tail-end of last season. Donovan has also been in sparkling form for his country at this summer’s World Cup, and City boss Roberto Mancini is keen to flex his considerable financial muscle in a bid to ward off other potential suitors. The Best of the Rest: City are also being linked with moves for Villa pair James Milner and Gabriel Agbonlahor, Benfica left-back Fabio Coentrao, Wolfsburg striker Edin Dzeko, Barcelona holding man Yaya Toure and PSV’s Mexican centre-back Francisco Rodriguez. One man who will be remaining at Eastlands next season is Argentine striker Carlos Tevez, as City have shrugged of reported interest from Real Madrid. Real coach Jose Mourinho hopes to conclude his summer spending with the showpiece double-signing of Chelsea’s Ashley Cole and Liverpool’s Steven Gerrard. Former Chelsea winger Joe Cole has received a £3 million-a-year contract offer from Italian giants AC Milan. Manchester United have made a £9.6 million bid for Greek winger Sotiris Ninis, who currently plays for Panathinaikos. Aston Villa are weighing up a cut-price move for Arsenal striker Eduardo, after learning that the Croatian international no longer features in manager Arsene Wenger‘s plans. Villa have also put aside £14 million with which they hope to secure the signings of West Ham captain Scott Parker and Bayer Leverkusen’s Swiss midfielder Tranquillo Barnetta. Everton have had a £900,000 bid accepted for Strasbourg forward Magaye Gueye and are also planning to make a £2 million offer for Hertha Berlin defender Arne Freidrich. Bolton are close to snapping up Brazilian striker Ilan, who is a free-agent after being released by West Ham at the end of the season. The Trotters are also rumoured to be in talks with veteran Burnley forward Robbie Blake over a move to the Reebok Stadium. Birmingham City have seen a £6 million bid for Fulham target man Bobby Zamora rejected. West Brom will enter talks with Lyon over the signing of striker Frederic Piquionne today after having a £1 million offer accepted yesterday afternoon. Milan Jovanovic has confirmed he is on his way to Liverpool for pre-season training, ending speculation his move could be off. The Serbian midfielder, who scored the winning goal for his country against Germany in the World Cup, will leave Standard Liege and join Liverpool on a three-year contract. Jovanovic, 29, rejected claims that the departure of ex-manager Rafael Benitez for Inter had ever affected his situation. “I am going to Liverpool,” he told Nieuwsblad. “I have signed there for three years. I repeat: no pre-agreement – a real contract. And the departure of Benítez changes nothing. “I have maintained contact with the Executive Board of Liverpool and everything is good. “Everything is in order since in the last two years I have played 75 per cent of the matches for my national side.